The Nova Scotia Tidal Energy Atlas is a joint project with Tekmap Consulting and the following partners: Acadia Tidal Energy Institute, Atlantic Canada Opportunities Agency, Nova Scotia Department of Energy, Offshore Energy Research Association, and Fundy Ocean Research Centre for Energy. 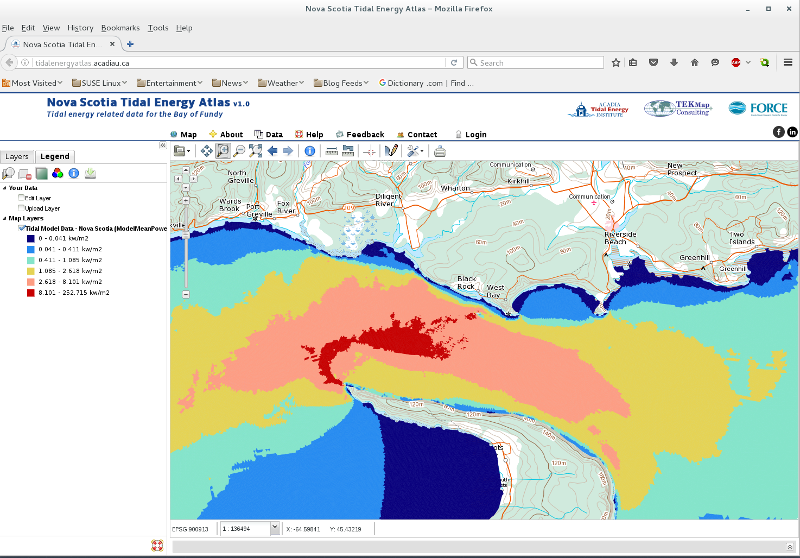 The purpose of this project is to provide on online, geospatial, interactive web mapping application that provides tidal energy and related data. Time/depth navigator for enabled layers. Vector buffer tool using WPS. Tidal model data scoring tool.